United Nations General Assembly at the UN Headquarters in New York City, United States. LAST week, the United Nations Association of Malaysia held its biennial dinner in Kuala Lumpur. Its guest list read like a who’s who of international relations in Malaysia, bringing together practitioners, advocates, and people who have dedicated their lives in pursuit of the UN’s mandates. Young and old, experienced and new, these guests came together to celebrate 60 years of UN-Malaysia relations. The UN has always held a certain fascination for most of us. Whether we idealistically admire it or bitterly criticise it, either way shows a fascination with the UN not enjoyed by other international organisations. Idealists and realists alike admire the UN for the promise and potential it represents. There is subtle assurance in knowing that there is a higher power in the governance of the world than just mere states interested in their own national interests. That the UN also work by collective decision-making provides that extra bit of security and trust that the will of the majority is always for the good of all. Pessimists and, yes, realists as well, criticise the UN for not doing enough, not being more and not taking a stronger stand on the ills of the world. The 65.3 million displaced persons globally is held up as a prime example of UN’s failure to act. The UN is also charged to have failed to address climate change, the nuclear issue and a host of other matters that, in the end, affect the safety and security of humankind. What the UN is, is a mixture of both. It is both a beacon of hope to those who have nothing else to depend on and nowhere else to turn. In the 72 years of the UN’s existence, it has helped to redistribute aid to more than 120 countries around the globe. The UN’s Central Emergency Response Fund, established in 2005, has doled out humanitarian assistance to 100 countries including “bad boy” North Korea. Yet, in other ways, the UN has failed to live up to its name. It stood by and ignored calls for additional help in Rwanda, leading to one of the worst genocides in history; it came in too late when the massacre of Srebrenica began; it washed its hands of introducing cholera in Haiti even though evidence showed that it was UN peacekeepers who started it. And, the list goes on. We fail to fully appreciate that collective decision-making, for all its laudable benefits, may not be so good after all. A collective takes time to come to a decision, if it ever comes to a satisfactory one at all. A collective decision, in order to preserve the collective, almost always decides on the lowest-common denominator rather than the course of action that might end the incident immediately. A collective decision, above all, allows the feel-good factor of having done something when in fact nothing tangible has been done. This is a case of non-responsibility, rather than irresponsibility. How many times have we said that “the UN should do this”, or “the UN must act immediately”? Whatever happened to “we should do this” or “we need to act, and act now”? When a calamity happens, rather than finding a way to help, we shift the responsibility to the wide shoulders of the UN — shoulders that at 72, are beginning to bow under the massive strain. The UN, for all its hype and bravado, is actually only the sum total of its parts. It cannot move on its own without the collective will, or at least the majority will. Its secretary-general is a secretary to the world’s leaders, and not a person who can, on his own, raise an army, or even his fist, against a state if it is not the will of UN members. The UN is the epitome of an organisation which is the sum total of its 193 parts. I am not advocating that the UN should be given more authority. I am a firm believer of Andrew Guzman’s Frankenstein effect — that the more power you give a supranational being, the more its chance of overstepping its bounds and wreaking destruction. It is this Frankenstein theory too that makes the UN unique. Never again will the world create an organisation with as many tentacles or as much power as the UN. Every other successful global body created after 1945 has been for a specific and narrow mandate — whether it is for international aviation, the prohibition of chemical weapons or for health. 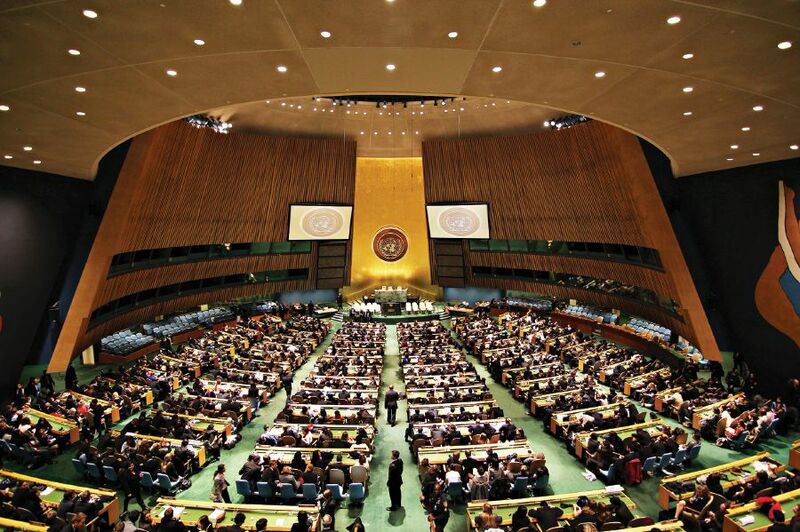 Love it or hate it, the UN evokes strong feelings in international relations practitioners. The powerful states use it to bend the will of others to their cause, and to give it the legitimacy not afforded a unilateral action. The not-so powerful states use the UN to canvass support and resources well beyond their own individual means. And, the weaker states use the UN as a shield to protect themselves from predators who prey upon their vulnerabilities. In short, the UN is powerful because it is something for everyone. It is powerful because of the promise in its existence, never mind whether that promise is fulfilled or not. As Malaysia marks 60 years of membership in the UN this year, we need to recognise the UN for what it is — it is not the panacea to the world’s problems, it is not even the problem-solver everyone wants it to be. The UN is us. We are the ones who make or break it. So, stop looking over our shoulders for someone else to blame. Shazelina Zainul Abidin is a foreign service officer and an honorary research fellow of the University of Sheffield. She writes primarily on international affairs. The fascination of the 'Land of the Cowboys of the East'!